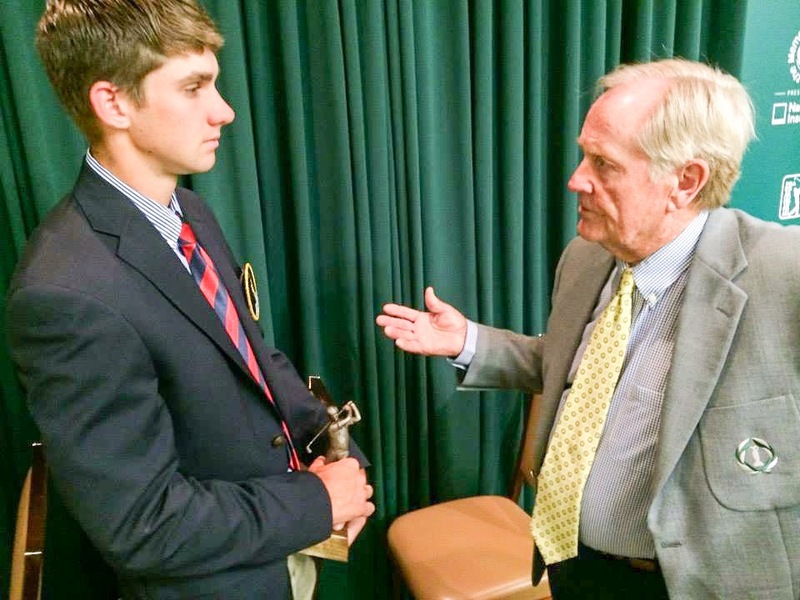 Jack Nicklaus meets with Patrick Rodgers, the former Stanford standout and winner of the 2014 Jack Nicklaus Award as the Division I Collegiate Player of the Year, at last year’s Memorial Tournament presented by Nationwide. Rodgers, now playing professionally, will be in next week’s Memorial Tournament field. Sarasota, Fla. — Five finalists have been named for the 2015 Division I Jack Nicklaus National Player of the Year Award presented by Barbasol. Georgia’s Lee McCoy, Maverick McNealy of Stanford, Washington’s Cheng-Tsung Pan, Arizona State’s Jon Rahm and Vanderbilt’s Hunter Stewart are finalists for the honor that will be presented by Jack Nicklaus at a ceremony during the final round of the Memorial Tournament presented by Nationwide Insurance at Muirfield Village Golf Club. Nicklaus, a Big Ten and NCAA Champion at The Ohio State University, helped inspire and create the Jack Nicklaus Awards in 1988. McCoy won three consecutive tournaments earlier this year, becoming the first Georgia player to accomplish that feat. He has four wins overall this season, tying the school record set by Chris Kirk and Russell Henley. McCoy has eight top 10 finishes and placed no worse than 17th in 11 events. McCoy was named to the United States Palmer Cup Team that will compete June 12–14 in Illinois and he was one of the 10 semifinalists for the Ben Hogan Award. His stroke average is 69.66. The Pac-12 Player of the Year, McNealy is the nation’s top-ranked college player in both the Golfstat Rankings and the Golfweek/Sagarin Rankings. He leads NCAA Division I with six collegiate victories this year, including Pac-12’s and NCAA Regionals. His 18-under 262 at the Pac-12 Championship established a league tournament scoring record. A three-time Pac-12 Golfer of the Month, he has been selected to compete this summer on the United States Palmer Cup team. He currently boasts a 68.70 stroke average. Pan was a finalist for the Ben Hogan Award and became the award’s first-ever four-time semifinalist. His four college wins in 2014–15 gave him eight career titles, breaking the school’s career win record. Pan’s victories came at the Waikoloa Intercollegiate, Querencia Cabo Collegiate, Lamkin San Diego Classic and NCAA Bremerton Regional. In all, he posted eight top-10 finishes and a 69.85 stroke average in 11 events. The Ben Hogan Award recipient, Rahm has won four college tournaments in 2014–15, capped by a two-shot victory at the NCAA San Diego Regional. He also won the Duck Invitational, ASU Thunderbird and Bill Cullum Invite. The junior has 10 consecutive top-8 finishes at college events and owns a 68.78 stroke average. His average is the second-best in recorded NCAA history. He was selected to represent Europe in this summer’s Palmer Cup. Stewart became Vanderbilt’s first SEC Player of the Year after averaging an all-time program-best 69.36 strokes per round this season. He won three individual titles, carded six top-five finishes, and 10 top 10’s in 2014–15, with his worst result being a tie for 11th. Stewart was also named to the Palmer Cup U.S. team and as a semifinalist for the Ben Hogan Award earlier this spring. Barbasol, America’s #1 Men’s Shaving Cream brand, was introduced as the first “brushless” tube of shaving cream in 1919. Currently offered in seven varieties—Original, Soothing Aloe, Pacific Rush, Sensitive Skin, Skin Conditioner, Arctic Chill and Mountain Blast—Barbasol continues to be made in America and is available at major retailers nationwide. Barbasol is owned by Dublin, Ohio-based Perio Inc. For more information about Barbasol, please visit barbasol.com.